From voaspecialenglish.com | facebook.com/voalearningenglish TOUR GUIDE: "My name is Janet and we're going to have a garden tour today." Visitors to the home of former President Thomas Jefferson are often surprised to hear about his interest in plants. TOUR GUIDE: "We're going to talk about Jefferson as a farmer, a scientist, an incredible landscape designer and somebody who tried, amazingly in our country, to get agriculture going." Jefferson lived here at Monticello, a 2,000 hectare property in central Virginia. He designed the house and grounds, and planted fruit trees. Peter Hatch is director of gardens and grounds at Monticello. PETER HATCH: "This was a laboratory for Thomas Jefferson, an Ellis Island, if you will, of new and unusual plants that came literally from around the world. Jefferson documented the planting of 330 varieties of vegetables and 170 varieties of fruit in this garden." 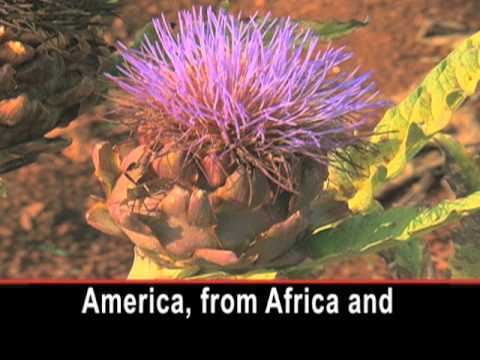 Thomas Jefferson collected seeds from across the world. He kept detailed records of their behavior from 1766 to 1824. PETER HATCH: "What Jefferson did was plant all these things that came from the tropics of America, from Africa and really expanded the palette. One wonders if any man had grown so many different things in one place before Jefferson assembled these things here at Monticello?" Hatch says his goal is to remain true to what Jefferson started at Monticello, while adding to the collection. PETER HATCH: "One of my concerns has been trying to find the old varieties of vegetables, the very same species that Jefferson was growing and also to plant in an interpretive way so people can see this really important facet of Jefferson's world view, the horticultural view." Kris Somers and Doug Corley are visiting from Colorado. They say Jefferson had an influence on everything they saw. CHRIS SOMERS: "I could see him out here because he was so neat and meticulous, even if he was experimenting." DOUG CORLEY: "I think he was on to something well before we are." CHRIS SOMERS: "I think that we could still learn a thing or two from what he's done here, sure." DOUG CORLEY: " ... for the backyard gardener out there today. It's quite a backyard. But he seems to have it right." Peter Hatch says Thomas Jefferson's advice to plant lovers today would be to experiment. They can start, he says, with seeds harvested from Monticello. I'm Barbara Klein. Смотрите видео Now, Some Gardening Advice, Brought to You by Thomas Jefferson и вы сможете быстро выучить английский язык. I did not know about Jefferson collecting plants from around the world. This has been very illuminating. Thank? you for posting this video.